1. Preheat your oven to 200˚C, and ensure that your turkey is at room temperature. Pat the skin dry with kitchen towel, then place it on your largest oven tray, and pour 2 cups of water or stock into the base of the tray. 2. Make an incision between the skin and breast of the turkey and stuff it with 200g butter. 3. Heat the tamarind paste in a pan with ginger, 4 cloves of crushed garlic, sugar, soy sauce, chili flakes and a cup of water. Bring to a boil and allow to reduce (or add water) until it has the texture of thick runny honey. Smother it all over the turkey. 4. Place 1 lemon, cut into quarters, and the handful of fresh herbs into the cavity of the bird, with a generous pinch of sea salt and black pepper. 5. Place the turkey in the oven, and immediately turn the heat down to 180˚C. Cover the turkey loosely with foil after 20 minutes then allow to cook until the juices run clear (precise time depends upon the size of your turkey) and the glaze is golden. Remove the foil roughly 20 minutes before you estimate the turkey to be cooked. 6. About 20 minutes before the turkey is to be removed from the oven to rest, line a baking tray with foil. Toss the sweet potato wedges in the remaining crushed garlic, olive oil, thyme and sage leaves. Season generously with sea salt and roast at 180˚C for roughly 45 minutes, until soft and golden. 7. Remove the turkey from the oven and allow to rest on a carving board at room temperature for at least 30 minutes before serving. 8. 20 minutes before you’re ready to eat, fry the chestnuts and pancetta in the remaining butter until lightly golden over a medium-high heat. Turn the heat to high and add the nutmeg before deglazing with sauternes. 9. Cook and stir until the wine has evaporated off then remove from the heat and put a lid on to keep warm. 10. Drain all of the juices from the turkey into the tray by tipping the bird. Skim off as much fat as possible using a spoon, then return the pan to a high heat. Stir in the flour and allow to cook for one minute, before whisking in 2 cups of stock. Allow to boil down until reduced to your liking. 11. 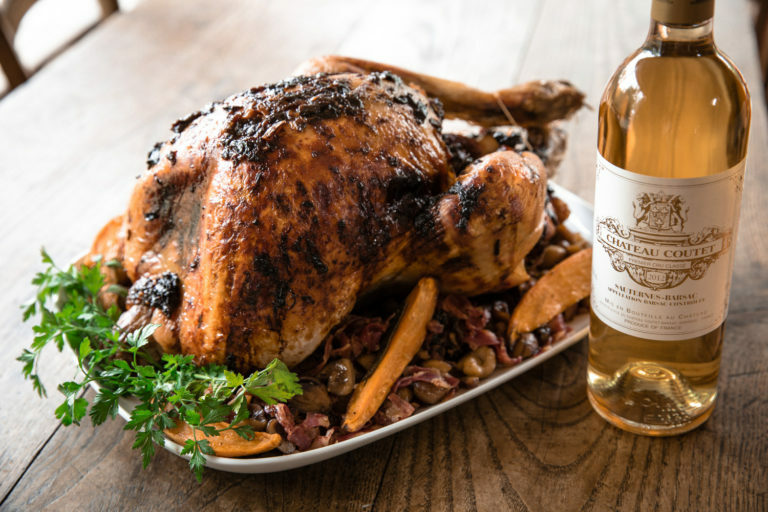 Carve and serve the turkey with the Sauternes chestnuts, sweet potato wedges and gravy.